A great many sporting and other clubs rely on volunteers to make ends meet. As one case showed, however, a failure to formalise such relationships in writing can lead to uncertainty and the evaporation of goodwill (Quinn v The Galley (Seaford) Limited). 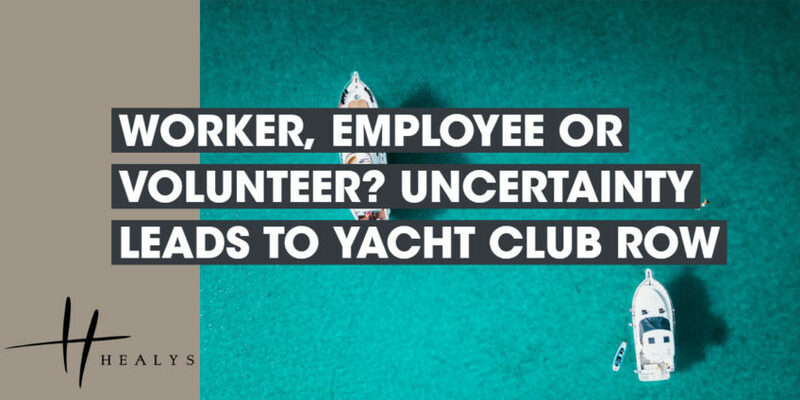 A yacht club was having difficulty making a success of its café and bar and one of its members stepped in to help. There was no dispute that he initially agreed to work as an unpaid volunteer, at least until the ‘ship had been steadied’. However, he had to work many more hours than he had anticipated and the club’s board agreed with him that he perhaps ought to be paid. The man claimed that it had been agreed at a board meeting that he should be paid £10 per hour for a 40-hour week. He said that all those at the meeting nodded their heads and appeared to concur that that was fair. After his hoped-for remuneration did not materialise, however, he withdrew his services and launched Employment Tribunal (ET) proceedings against the club. He claimed to have had the status either of a worker or an employee and that, as such, he should have been paid. The ET praised the man’s hard work in keeping the café and bar open. He had been commendably unwilling to walk away and leave the club in the lurch. In rejecting his complaint, however, the ET noted that the contemporaneous documents did not support his version of what had been agreed at the meeting. The board had given no firm commitment that he would be paid and there was no basis for his claim that his status had progressed from that of an unpaid volunteer.